Q: What is 35 feet long and has 42 teeth? A: A bus full of rednecks. One redneck to the other: Do you think I should tell my folks I’m adopted? Q: What’s the downside of being a redneck kid at Christmas? A: You just have one set of grandparents to get presents from. How do you tell a redneck is married? There are tobacco spits on either side of his pickup truck. Why do pigeons fly over trailer parks with their backs down? There’s nothing worth crapping on. When two rednecks divorce, do they still remain family? Redneck: "My girl broke up with me... at least she said we could still be cousins. "Why don’t rednecks get sick so often? Germs have their pride too. You see a "No crack" sign and you pull your pants up. You see your farts as your best jokes. The dog can’t help gagging whenever he sees you eat. You finally get to cutting the grass and find a car. Your family tree is just one long trunk with no branches. You took out your toothpick only for wedding pictures. Fast food is hitting a possum at 80 mph. You've at least once hit a deer with your car because the food store was already closed. You’ve ever had the thought rat traps made acceptable gifts. A night trip to the bathroom involves mud boots. People hear you coming in your car quite a long time before they get to see you. You have lard on your bedside table. You had to ditch your back seat bench so all your children could fit in. Sixth grade is senior year. You have a really bad fall and the one thing you save is your beer. You had to buy a VCR because all the wrestling matches are on when you're at work. You take your garbage to the dump and come back with more than you brought there. They banned you from the zoo because you distress the monkeys. You keep seeing your neighbors on Jerry Springer. There’s a spit cup on your bedside table. You have more than one fur coat – all home made. When something should be stored cold, you put it in the shade. You see family reunions as a good chance to meet boys and your mother agrees. You've ever had to get financing for a tattoo. You’ve been married three times but your in-laws are still the same people. Preparing a bubble bath involves beans for dinner. Your fridge and you weigh roughly the same. You owe money at the dollar store. The school encourages you to stay away from PTA meetings at your son’s school. You can burp your name. 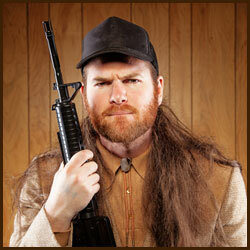 * A small note: It is NOT OK to use REDNECK JOKES, although they are hilarious, to make actual people feel bad. Putting others down never won anybody any real friends, even when people laugh with you at the time. You will be influenced by everything you give out, so best give out something positive. And hey, while you're at it, enjoy these mean, wrong and ridiculously funny jokes, for, you know, academic purposes!